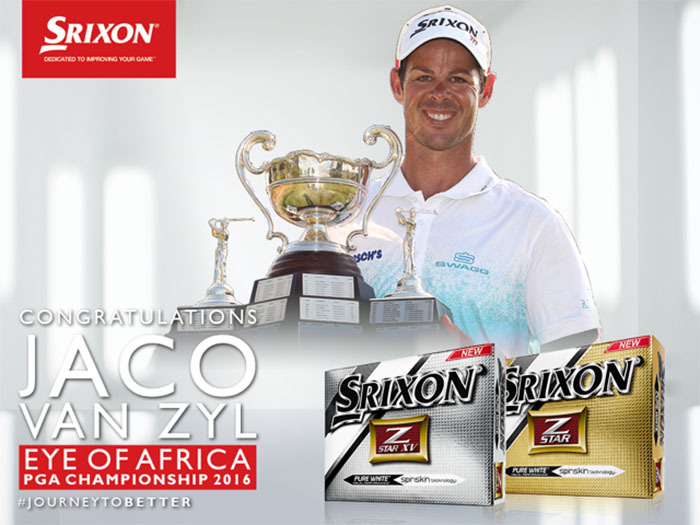 Srixon and Cleveland Golf congratulate staffer Jaco Van Zyl for his victory at the Eye of Africa PGA Championship 2016 , South Africa. Jaco carded a final round of five under to finish regulation play tied at 20 Under par, 268. He ultimately clinched the win on the first sudden-death playoff against fellow Srixon Staffer, Dean Burmester. This EYE OF AFRICA PGA Championship victory represents Jaco Van Zyl’s third win of the title, and in turn entry into the top 50 Official World Golf Rankings. Van Zyl played with Srixon’s new 4th generation Z STAR XV ball with SpinSkin Technology, Srixon Z-745 irons (#4-PW with Nippon Modus 3 105X Shafts), Srixon U45 20 degree Utility, Cleveland Golf 588 RTX 2.0 wedges (50°, 56°, 60°) and Cleveland TFI Smart Square Blade putter. Jaco wears a Srixon hat, a Srixon glove, and carries a Srixon bag and umbrella.